Another year of Project Life has started and I'm ready for it! I kept my title page really simple. 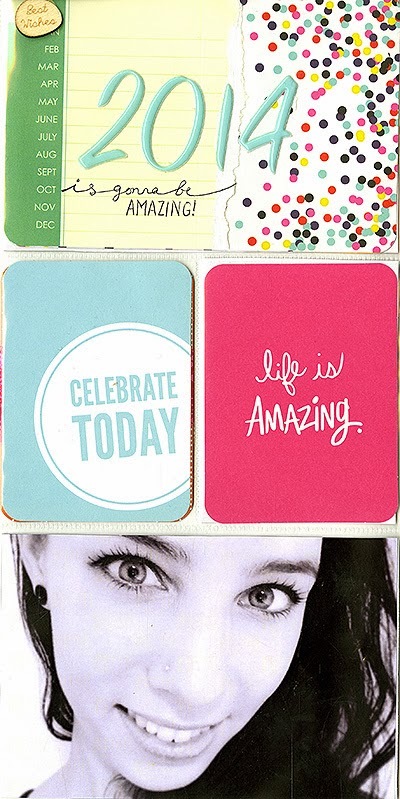 I love the bright colors of these cards in combination with the black and white photo. The main thing is that I want 2014 to be amazing, just like last year. I think that's everybody's wish, but that's okay. I just like the fact that I don't have any new years resolutions, other than doing what I did. I already worked out a lot, I eat healthy, I do a lot of fun stuff. So there isn't anything I wish to change. And that's good. It makes me feel at ease. I took a little time of blogging the last couple of weeks, because we were both very busy. But I'm back again. I've got more Project Life pages to show you and a couple of new paintings I've made. I'm also working on a couple of recipes and a Project Life related DIY. So make sure to check back again soon!